It’s the Gibbs Triski Three-Wheeled Amphibian! Capable of 85 mph on land and a whopping 45 mph at sea, the gas-powered, turbocharged, 135 horsepower weighs less than a 1,400 lbs. This means it’s easy to maneuver on and off land. Click (here) for more information. Designed for congested urban areas, the Mahindra Genze 2.0s is an all-electric scooter that packs some unique features along with a handsome, utilitarian frame. What people love most about the 2.0 is how it behaves—the throttle response is powerful and predictably smooth. The responsiveness & unmatched performance are the result of extensive testing & refinement that went into the GenZe 2.0’s proprietary control system. Our Powertrain Control Module is completely integrated over a CANbus network to control operation, and monitor and report on diagnostics. Look at these cool Cargar wheels for Golf Carts! Franklin, TN – July 6, 2017 – The Carlstar Group announced today the launch of the new Cragar 401C S/S Golf Cart Series. 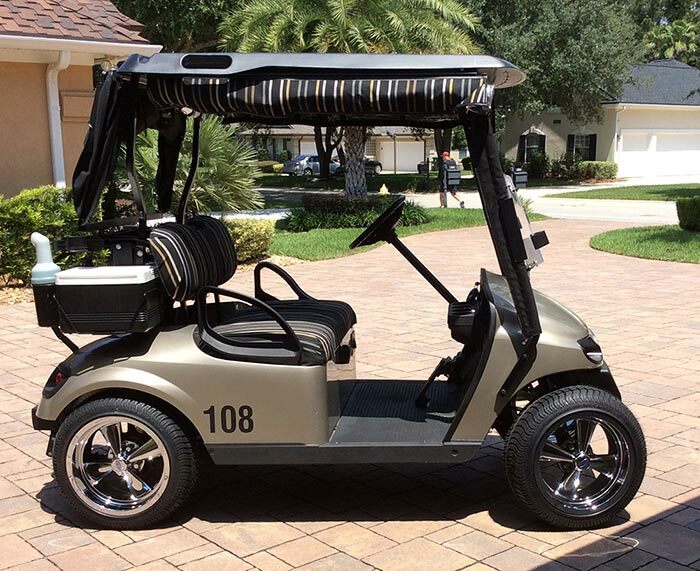 Known as the “original muscle car wheel”, the iconic design of the Cragar S/S wheel has been reimagined and brings head turning hot-rod style to golf carts. The lightweight, cast aluminum wheels are available in 10 inch, 12 inch and 14 inch sizes. Tire and wheel assemblies are available in all three sizes. Established in 1964, the original Cragar S/S wheels created the standard for auto enthusiasts. Known for its timeless style, design and dependable performance in drag racing, the Cragar S/S was coined “the world’s fastest wheel.” As the legend of Cragar S/S wheels grew, demand to expand beyond passenger car wheels became an essential addition to the Cragar wheel portfolio. I recently rode to Tofino on a motorcycle weekend getaway with my husband. The roads are narrow and twisty – riding nirvana! The scenery is stunning. If you haven’t ridden Vancouver Island’s Hwy 4, you are missing out! The treasure at the end HWY 4 is the Pacific Rim National Park where Long Beach is located is a BC surfer mecca. Just ask Canada’s Prime Minister Justin Trudeau, he was here out ripping the waves last summer. At one end of the park is Ucluelet which in the first people’s Nuu chal-nuth language it means “People of Safe Harbour” on the other end is the fishing hamlet of Tofino which is situated on the picturesque Clayoquot Sound. You can read this and other blogs on Farkle Garage TV’s website by clicking (here). Both communities are accessed via Hwy 4, which is very isolated stretch of road. Tofino and Ucluelet draw tourists from around the globe to take advantage of the stunning scenery, ocean adventures, hiking/camping and the best motorcycle twisties! Stop by the Visitor Centre to learn a little bit about the area. On your ride in stop at the Ellis River and dangle your feet in the icy cold water and enjoy the scenery. Stop at Long Beach in the Pacific Rim National Park Reserve and take a stroll on the beach and wiggle your toes in the sand. Go for a stroll on Long Beach to find the Red Chairs perched on a rock, the view is incredible! You will find these chairs in most of Canada’s National Parks which encourages visitors to sit and take in the view. Once you’ve had enough beach time leisurely make your way into Tofino and explore this eclectic little hamlet. There are quaint shops to browse in and great places to eat! Enjoy your stay! Subscribe to Autowerkz.TV for videos from Farkle Garage and many other two-wheeled adventures! The EV3 Doohan (SSR in the U.S.) iTank is an electric, three-wheeled scooter that promises high performance (0-28 mph in 4.6-seconds) with its 1500w power, 50/50 weight distribution with a low center of gravity, a 70-mile range and removable batteries which can charge from empty to 100% in about 6-hours using 110v. This is the improved, second generation (2.0) of this German-designed/Chinese-manufactured scooter. The EV3 Doohan SSR iTank Three-Wheeled, Electric Scooter is available on Amazon for around $2,999. Many riders tout the EV3 Doohan SSR iTank Three-Wheeled, Electric Scooter as an extremely easy vehicle to ride. While many cities in the United States allow electric scooter riders to ride without a motorcycle endorsement, it’s a good idea to check with your local DMV for any restrictions.